If you run an online WooCommerce store and ship using USPS or Canada post, WooCommerce now offers a free shipping plugin. This is great news if you use either of these shipping methods. In the past, you’d have to buy a shipping plugin for around $79. Now it’s free. But, as they say, you get what you pay for. But maybe not in this case. Maybe you get more. Add USPS Shipping to WooCommerce. I discovered this plugin because a link to it appeared in a WooCommerce site I was still working on. In fact, I was looking for a shipping solution for this site. The owner was on a tight budget and the store products shipped only in the US. I installed the plugin and after a few minutes configuring it, I was getting USPS shipping rates on the site based on product weight and dimensions. Were the rates accurate? I did not test this. Usually, the store owner knows a lot more about what it costs to ship their products than I do. The good part is that it’s very easy to adjust the prices up or down. 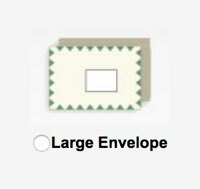 To name a few: First-Class Mail – Stamped Letter; First-Class Mail – Metered Letter; First-Class Mail – Parcel; First-Class Mail – Large Postcards; First-Class Mail – Postcards; First-Class Mail – Large Envelope; First-Class Package Service. It has at least a couple dozen more. Price Adjustment – For each of the USPS services, you can adjust the price up or down. This offers great flexibility. Often, shipping plugins provide only the ability to increase or decrease ALL prices, but not the prices of each service. Which Rates to Use? You can show all available rates and let customers choose or you can show only the cheapest rate. 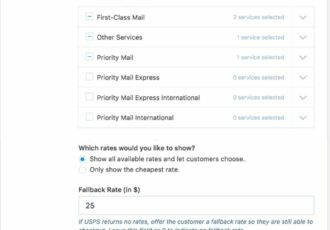 Fallback Rate – The rate used if no rate is returned from USPS due to package size or weight. This is a very handly feature and work around. For example, the site I was working on had two products that were 48″ x 48″ x 48″ and weighed 60 pounds. USPS does not handle packages of that size or weight, but since both products were close in size and weight, I added a fallback rate that would cover their shipping on UPS. Charge Commercial or Retail USPS Rates? You can specify wether to use the USPS retail or commercial rates. Packing Method – You can specify that when it’s more economical, the plugin will calculate the cost for packing multiple items into a single package. Or you can specify to ship each item individually. How the multiple items calculation works is that the plugin takes the weight and diminsions of individual products and then calculates how many will fit into a single larger box. You define what size of larger boxes you use to pack multiple items, and the plugin calculates how many will fit into a larger box. This is a very nice USPS shipping plugin. Usually, you would have to pay for this kind of plugin. I give it 5 stars. It would be nice if this handled UPS too. Is that too much to hope for? Maybe, but the plugin description on WordPress.org indicates that this version is only the beginning and more features will be added in the future. Note: I did not test the Canada Post feature. Download Install the WooCommerce Services plugin. How to install WordPress plugins. 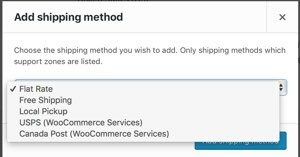 Go to WooCommerce > Settings > Shipping > Shipping Zones. Click the Plus button on the Shipping zone to which you want to add the USPS shipping method. For example, I added the USPS shipping method to the United States shipping zone. The Add shipping method screen is displayed. Select USPS (WooCommerce Services) and the click Add shipping method. The USPS shipping method is added. Click the USPS shipping method link displayed in the Shipping Methods column of the shipping zone. The USPS Shipping Method screen is displayed. Optional – You can change the Shipping Method title to whatever you want. Enter a ZIP code in the Origin ZIP Code field. In order to get accurate rates, the ZIP code needs to be the ZIP from which you ship products. 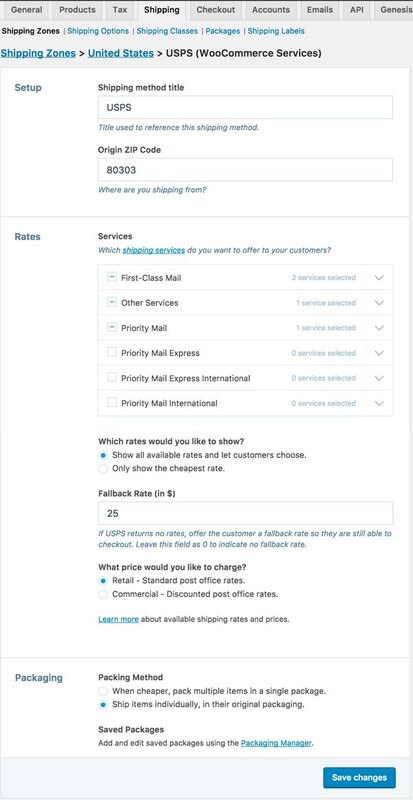 In the Rates section, select the USPS services you want to use. You have to pick at least one. Optional – You can adjust each service rate up or down. Select an option for Which rates would you like to show? Show all rates or only the cheapest rate. Optional – Specify a fallback rate. Use zero ( 0 ) to disable this feature. Important – If you don’t select a fallback rate, then products that don’t return a USPS shipping rate will display the message: There are no shipping methods available. Please double check your address, or contact us if you need any help. Select an option for What price would you like to charge? Retail or Commercial price. Select a Packing Method. Pack multiple items in a single package or package each product individually. Optional – If you select to pack multiple items in a single package, you can define what size those packages are. Test the USPS shipping rates. If you’re getting the message that says There are no shipping methods available…, make sure the shipping address is in the shipping zone to which you added the USPS shipping method. Also, make sure that the product is within the USPS size and weight limitations.